Drain tofu. Wrap securely, like a parcel, in several layers of kitchen paper and place on a board. Press gently to extract as much liquid as possible without crumbling the tofu. Repeat this process until there is only a little moisture coming through the paper. Carefully cut tofu in half horizontally and then in each direction 4 times to make small cubes. Place in large bowl. Put 6 cloves of crushed garlic in a small bowl with oil and salt and mix well. Dot the mixture over the tofu cubes and, taking care not to break the cubes, coat them with the garlic paste. Cover tightly and marinate in fridge for between 1 and 12 hours. Preheat oven to 180C/350/F/Gas 4. Line baking tray with baking parchment/non-stick baking paper. Place tofu on lined baking tray and cook for 30 minutes, stirring after 20 minutes. Put basil leaves, lemon zest and juice, garlic and pine nuts into a processor and blend until a paste is formed. Add stock powder, sugar, salt and pepper and process again briefly. When the tofu is cooked turn off oven. Put half the pesto into a large bowl. Add cooked tofu and gently turn it over to cover all cubes. Put tofu back onto baking tray and return to oven for 5 minutes. Remove from oven and leave to cool. Mix yoghurt with 6–8 tsp of remaining pesto. 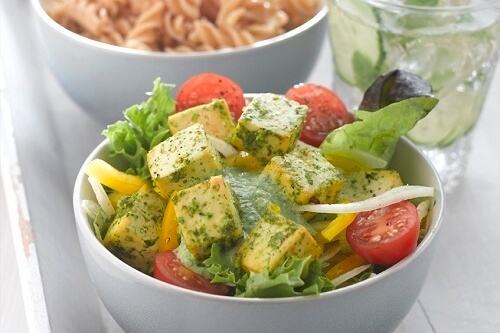 Arrange the salad on individual plates, scatter with tofu cubes and dress with a little of the yoghurt. Serve the remaining dressing separately.